These Legion of Doom-focused issues have been some of the most interesting stuff coming out of this series. James Tynion is doing a really wonderful job with the three of them that have been released thus far, including this one. He really has a handle on these characters and the overall story and his Justice League stories have been his best work by far, easily. I include JUSTICE LEAGUE DARK in the equation as well. Each of these side issues has a unique artist, and Guillem March is certainly a unique choice. March and Tynion have worked together before so there is a bit of symmetry when it comes to the plotting. This books just works, visually. Everything here is so expressive and exaggerated and it looked amazing. Arif Prianto doesn't do much anymore, as far as I can tell, and his work here was fantastic. And of course the series letterer Tom Napolitano does incredible work. Joker's dialogue has been stylised with different fonts since DEATH OF THE FAMILY, and here Napolitano slightly tweaks it and makes it a bit more readable and overall more realistic. Joker's former fonts were a bit too scratchy for my taste. If you're reading this series, then you should definitely read THE BATMAN WHO LAUGHS, the first issue of which is releasing next week. This leads into that series by Scott Snyder and Jock, and I think it's gonna be fantastic. The Legion of Doom is somewhat fractured and falling apart following Black Manta's betrayal of the team and his apparent death in DROWNED EARTH. Tynion brilliantly calls back to the somewhat occasional moments when the Justice League would hold a recruitment drive in a search for more team members. Here, Lex Luthor doesn't want any more team members while the others members of the Legion do, so they're holding a recruitment drive featuring some of your favourite villains. 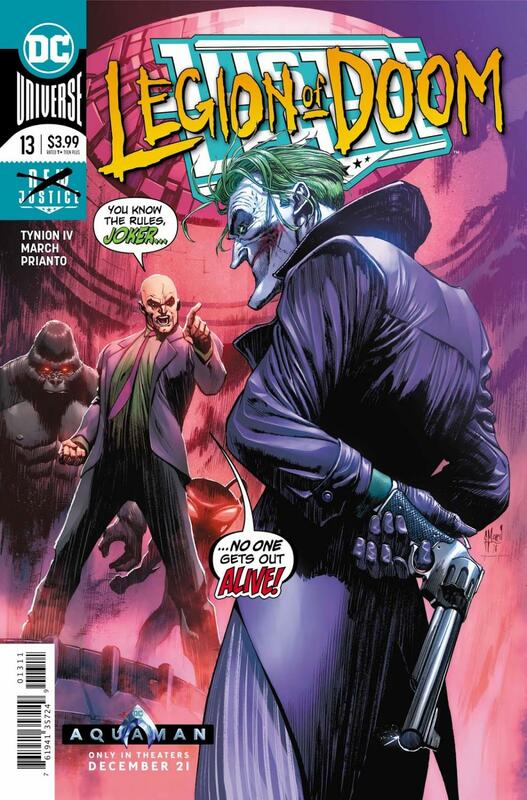 Joker is unleashed here, and Tynion's voice for the character was fresh and I can't wait to see where the character goes next following the events of this issue. He's a genius, but a genius of a different kind.